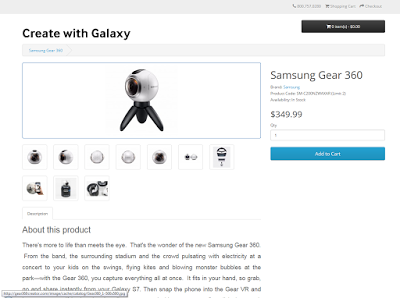 The Samsung Gear 360 (reviewed here) is now available online in the US, directly from Samsung. It’s not yet full retail availability, but it’s available to virtually anyone – no need to attend a conference. There is a catch though: to order the Samsung Gear 360, you need to register for the Samsung Creators Awards contest (details here) and create an account with Samsung. You will receive an email that lets you order the Gear 360 before it becomes available to the general public. After you receive your email, you need to go to the website Gear360creator.com . You then enter the ‘unique code’ that was sent to you in the email. Mine was B6230373 – I don’t know if that works only once. Feel free to use mine if you can! The price is $349.99, with a limit of 2 per person.